More on The Healthy Fruit!! 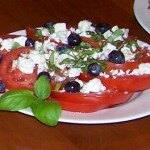 The Tomato Blueberry Feta Salad is a very tasty and colorful complement to any table. It can be served as individual salads or as a large salad to be passed. Prepare 30 minutes before serving. Allow the salad to sit at room temperature for 30 minutes before serving. Prepare 30 minutes before serving. Arrange sliced Tomatoes on serving plate, Sprinkle with crumbled Feta Cheese, Salt and Pepper to taste (optional), Chop or slice Fresh Basil leaves and sprinkle on top, Drizzle Cherry Knoll Blueberry Wine Vinegar over all (to taste), Sprinkle Blueberries on top. Allow the salad to sit at room temperature for 30 minutes before serving. Serve and enjoy.